In our universe, there are plenty of super heroes and villains to be found. However, Falter, as he's come to be known is hard to classify as good or bad. It's true that this apparent mute is a cold blooded murderer, but his victims seem to be only people who lead a wicked life. Is he an agent of Heaven exacting a calculated vengeance, purging evil souls from the Earth? Or is he working for the other side to recruit the souls of the wayward? It's possible that not even Falter himself knows the answer. Regardless, one thing is for certain: He is a Force, and what separates a force from everyone else is his impossible lack of compromise. There is no reasoning with him, there is no talking him out of what he must do. He simply carries out his missions... with finality. Falter possesses a number of supernatural abilities. 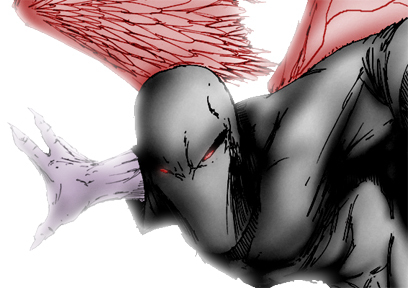 Most noticeable is his unusual pair of wings, one demon-like and one angelic. These wings allow Falter to fly at great speeds. His skin, though it may look decomposed, is actually very resistant to damage and can regenerate if damaged or torn off. Falter has talon-like fingernails, capable of tearing open human flesh. He is often seen with a halo of broken glass circling over his head, and he can send these shards out like projectiles at his enemies. And last but not least is Falter's massive cross-like sword. This holy (or unholy) instrument cannot be broken and is Falter's weapon of choice for impaling the hearts of the wicked. Some things never change, and that seems to be true for Falter's one and only mission. People have a new reason to mind their behavior... and his name is Falter.